Robert “Bob” Clifton Wootton, age 75, passed away at 3:30pm on Sunday, April 9, 2017. Bob is survived by his wife of 33 years, Vicky, and his daughters, Scarlett (Mark) Keen and Montana (Seth) Burgess. Bob joined the United States Army in 1961 right after he graduated high school and was proud and honored to serve his country for three years. 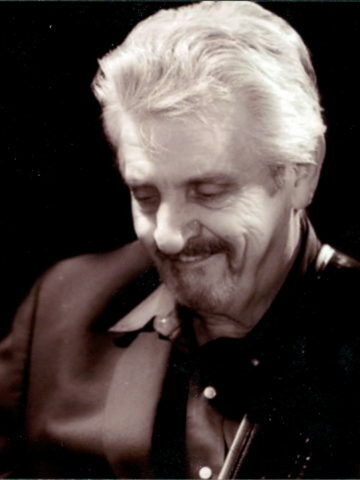 A fan in the truest sense of the word, Bob was Johnny Cash’s lead guitar player from 1968 up until Cash’s retirement in 1997. He finished out his career touring as The Tennessee Three and played to sold out crowds in Canada, Ireland, Scotland, Spain, Italy, England, and the United States. When Bob wasn’t on the road, he was quite the home-body and enjoyed just spending time with his girls. He loved to go fishing and watching Westerns and the Dallas Cowboys play football. Bob and Vicky are members at and attend Cornerstone Nashville. We would like to thank all of the friends, family, and fans that have been in prayer for us over this past week and ask that you continue to pray for us as we deal with Heaven gaining our beloved husband and father. Visitation will be held on Wednesday, April 12, 2017 from 4PM-8PM at Hendersonville Memorial Gardens. Bob’s life will be celebrated at Cornerstone Nashville on Thursday, April 13, 2017 at 11:00AM with visitation starting at 10:00AM. Burial will be at Hendersonville Memorial Gardens. All are welcome to attend. My condolences to the Wootton family. My condolences to the Wootton family, it was a pleasure meeting Bob on a couple occasions, very pleasant man to speak with and a great musician. Sending my prayers to the family. My prayers and thoughts are with Bob and his family. I had the chance to attend many Johnny Cash Shows and enjoyed not only Bob’s guitar playing but it was a real treat when he sang. My Dad passed in January and it has been the memories that help me everyday. Every time memories come to mind be sure that Bob is up there and sharing along with you. Vickie, Scarlett and Montana, Our thoughts and prayers are with you at this time. Bob was a great musician. Love ya’ll. Vickie, Scarlett and Montana, You are in my prayers at this time of loss. I have many fond memories of ya’ll thru the years. Vickie, Scarlett and Montana. I’m so sorry to hear of Bob’s passing and sad that I wasn’t able to make it up to see you and him again. Please know that you’re in my thoughts and have my sincere condolences. Our prayers are with you! May the Holy Spirit, who is THE COMFORTER, surround you in this season. We loved Uncle Robert and know he is in heaven. We will see you this week. What a great guy, so talented, and kind to his fans. Bob drove entertainer coaches for us at Senators for a number of years, after he stopped touring with Johnny Cash. He was loved by all of us here at Senators Coaches. We have received messages of condolences from Bob’s friends from his driving days. Charlie Hernandez with Sting asked me to pass on his sympathy to the family. Mr Wootton was a fabulous guitar player and a real gentleman to the fans. He will be greatly missed but can you image the joyous music heard in heaven. I was seven years old when I first saw and heard a young Bob Wootton perform with Johnny Cash at Carnegie Hall shortly after Luther Perkins passing in ’68. Mr. Wootton not only helped keep the famous “sound” alive but forged his own musical legacy in the process. I got to meet him many years later here in NJ and he was kind and gracious to everyone who approached him. A fine guitarist and a true gentleman who will be truly missed. May God bless and comfort the entire Wootton family at this difficult time. No one can say at a time like this. No one can say the right words or do the right thing in times like these. From the first I met him to the last time I laid eyes on him, he made me feel just like a member of the family. We shared many great times and memories, especially one at Paragould, Arkansas. All Lisa’s love and prayers sent to you all. Vicky, Scarlett, and Montana, God bless you. Our family sends sincere condolences to the Wootton family. We were big Johnny Cash fans and loved Bobs guitar playing. When the Johnny Cash Show would come to our hometown of Davenport Iowa they played at the Masonic Temple downtown.Back in the day a lot of country stars played there.Who could ever forget Anita Carter’s beautiful voice too.God Bless. I met Bob Wooton in 1972 wihile living and working and going to school in Oklahoma City Oklahoma. I worked with his Mother and brother. They were so proud of their son and brother. I know they miss his very much. I truly enjoyed his music. THANKYOU MR WOOTTON FOR PLAYING GUITAR FOR ONE OF THE WORLDS BEST SINGING SENSATION.I AM LOOKING FORWARD MEETING YOU GUYS IN HEAVEN. I KNOW MR WOOTON IS STILL PLAYING GUITAR. THANKYOU FOR ALLOWING ME TO WRITE THIS EMAIL ABOUT BOB WOOTTON. SENCERLY TOM WILLIAMS. Vicky, Scarlet and Montana it is a very sad day to hear about Bob’s passing. I watch video’s about him over and over with John and the Tennessee three he will be missed very much as one of the best guitar players ever. My thoughts and prayers are with your family, god bless. Our thoughts and prayers are with his wife and children. May God Bless Bob Wootton. Tennessee Three played @ Cowboy’s. Sound Behind Johnny Cash” albums. Took his picture. Very pleasent & kind man. Saw him in concert with Cash 2 times. One of the hundreds recorded. Him & John back pickin’ again. Sorry we lost touch! I had tried to find out several times about how Bob and your family were. I have been sole care taker for Mom since Mike passed in ’06. It’s a hard job when you are the only one. I know Bob is walking with Jesus. God is the way, the truth, and the light. I have seen the LIGHT. or call if you ever come back to your old home. It was an honor to have met Bob in Osage, Iowa. We had quite the conversation, after his excellent performance. I grew up listening to him with Johnny. I am surely gonna miss you Bob. Your friend in Charles City, Iowa..
player. May the “Cash Sound ” live forever. I met him backstage in Rochester Mn with my son. Something we will not forget. Talked music it was nice to spend time talking with him and hearing him play . My Heart broke last night watching the CMA’s. I am so sorry to hear Robert Bob Wootton passed away earlier this year. Vicky, Scarlett and Montana I hope your hearts heal fast. I will make sure I give Joyce a few extra hugs when I see her. I need to make sure and take Tyler with me, so she can see how much he has grown over the years. It was always a pleasure to see Bob perform with John and June. I loved going to Branson, Mo to see them all.